Over the weekend, the Edmonton Eskimos abruptly ended their 8 year relationship with Danny Maciocia by firing him. From decent offensive coordinator to comically inept head coach to borderline retarded general manager, the Rider Prophet has watched the progression of Maciocia’s career with great interest. Mainly because it provided such fantastic comic relief but also out of pure curiosity. Maciocia was a rarity in the sporting world in that his position in the organization seemed to increase proportional to the decrease in his performance. That kind of inverse correlation is unheard of. And so as I remorsefully bid adieu to one of my perennial punch lines, let’s take found look back at some of my favourite Maciocia memories. For whatever reason, Maciocia had a huge aversion to running the football. The Esks almost always had the worst rushing attack in the league. The culmination was in Maciocia’s final game as head coach, the East Final in 2008. With a chance to play for the Grey Cup on the line, Maciocia’s Esks managed only 3 yards rushing. Outstanding! In his time as coach, the Esks never had a decent secondary… but it wasn’t for lack of trying. Each year, Maciocia would go out and acquire the top DBs available (Omarr Morgan, Stanford Samuels, Jordan Younger), generally paying top $ for them. Despite their all-star status they would all end up having terrible years and get released to following offeason in favour of the next high priced DB whose career they planned to ruin. Definition: To succeed despite idiocy. In 2005, Maciocia was named Head Coach in Edmonton. He inherited a team that was so full of talent that even an idiot could have coached them to a Grey Cup win… and he did. As evidence of the Esks succeeding despite Maciocia’s idiocy, I submit this video of Maciocia dancing in celebration because he thought the game was over… it was not, there was still one play left. 2007 was Maciocia’s first year as GM. One of his first official acts as GM was the draft. In a move that defied all logic and common sense, he proceeded to select a kicker (Warren Keane) with the 2nd overall selection. Keane went on to play 0 games for the Eskimos and was eventually cut. It remains one of the biggest wastes of a draft pick in recent memory. In terms of Rider memories of Maciocia, one will always stick out in my mind. In 2006, a game between the Riders and Esks came down to the final play of the game. All Maciocia and the Esks had to do was keep the Riders from driving 55 yds for TD to secure the win. This almost proved to be too difficult for them. "I miss him. I care for him. I love him a lot. I try to talk to him only once a week. There's days where I think about him. I want to call and then I tell myself, 'No, I just talked to him yesterday. Just don't bother him.' 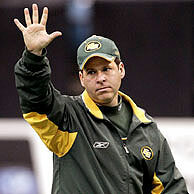 "
'06 was a bad year for the Esks, in a game against the Bombers they had another late game meldown. Yet again it came down to the final play of the game and yet again all Maciocia and the Esks had to do was keep the Bombers from scoring a major. This time the task was even easier since the Bombers were 100 yards away from the goal line. This time however the task proved to be too difficult. Despite all that I’ve mentioned above, Maciocia will forever be remembered as the guy that broke the playoff streak. Between 1972 and 2005 the Eskimos never missed the playoffs, setting a North American professional sports franchise record. It seemed like the streak would never end. I mean only 2 teams in the CFL don’t make the playoffs and at the time Hamilton was the laughingstock of the CFL so all the Esks had to do was be better than 1 team not named the Ti-Cats to keep the streak alive. But Maciocia wasn’t up to the task. Under his guidance the Esks missed the playoffs for the first time in 35 years, forever cementing his legacy as a loser in the City of Champions. For some odd reason, for this historic failure, Maciocia was actually rewarded with a promotion to General Manager of the Eskimos. And so we bid adieu to Danny Maciocia. Your contributions to the comedic content on this blog will be greatly missed. Farewell Danny. Let's all hope and pray that Calgary or Montreal hire him in some official role. Monday Morning Sentimonies: More Merchandising!